On February 9, 2014, as temperatures climbed to 104 degrees and wind gusts exceeded sixty miles an hour, abandoned coal mines on the outskirts of Melbourne, Australia, began to catch fire. By noon, blazes raged across sixty-two square miles of the coal-rich Latrobe Valley. The worst nearly engulfed the small town of Morwell, population 14,000, home to the ancient Hazelwood coal-fired power plant and an immense open-cut mine abutting the town. For weeks the fires burned with unabated intensity, sending up plumes of black smoke that darkened the sky. The people of Morwell appealed to the owners of the coal plant and to the government, but the authorities responded with bland assurances that the toxic smoke would have no lasting impact on their health. The residents also received a shipment of face masks and plastic buckets to sweep up the black ash that blanketed their homes, cars and furniture. After more than six weeks, the fire was brought under control, leaving a community traumatized not only by the event, but by the conviction that their leaders had no intention of freeing them from the grip of the dangerous and dying coal industry. Australia is in the midst of a desperate battle for its energy future. Prime Minister Tony Abbott, head of the archconservative Australian Liberal Party, has staked the future of his party, his country and in many ways the world on a plan to nearly triple coal exports. In doing so, he has boldly defied international efforts to slow carbon emissions and undermined his own country’s efforts to play a leading role in the fight against climate change. Since winning office in 2013, Abbott has systematically dismantled the previous party’s support for renewable energy. He repealed the fledgling carbon price, which had consistently lowered emissions in the two years during which it was operational. He has tried to shake off Australia’s international emission commitments and reduced government investment in renewable technology. He is currently seeking to reduce the hours of renewable energy production required by the country’s mandatory renewable energy target (RET), a benchmark set to move Australia to 20 percent renewable energy by 2020. Many of Australia’s state governments have followed suit, abolishing the key incentives that helped enable 10 percent of Australian households to install solar photovoltaic units on their rooftops. When it was Australia’s turn to host the G20 economic meeting last year, Abbott lobbied hard—though unsuccessfully—to keep the topic of climate change off the agenda. Abbott’s certainty about the bright future for fossil fuels does not square with the declining international market for coal. Two of Australia’s principal customers—China and India—have recently imposed restrictions and tariffs to reduce their coal imports significantly. For China, it is a matter of shifting demand to domestic miners, who have been losing money for several years. Chinese officials have also promised the United States that they are going to make sharp reductions in their carbon pollution in an effort to slow climate change and protect their own citizens, who are choking on emissions in their major cities. Some companies are taking this advice despite the government’s position. In mid-April, AGL Energy, Australia’s largest emitter of greenhouse gases, announced a “measured process of decarbonisation.” Andrew Vesey, the American-born chief executive officer, was hired with the explicit goal “to steer us through the opportunity and challenges of ‘distributed energy and storage,” according to chairman Jeremy Maycock. Since taking over the company in February, Vesey has embraced a bold position on Australia’s energy future, including a promise to immediately stop building or purchasing any more coal-fired plants without the capacity to store their own carbon emissions, and eliminate the remaining ones by 2050. “It is important that government policy incentivises investment in lower-emitting technology,” Vesey said in a prepared statement, “while at the same time ensuring that older, less efficient and reliable power stations are removed from Australia’s energy mix.” Vesey made the announcement on the same day that AGL completed installation at the Nyngan Solar Plant in western New South Wales, a facility generating 102 megawatts from nearly 1.4 million solar panels. Though many of Australia’s domestic and international customers are signaling that they do not want more coal, Abbott is campaigning to open scores of mammoth open-cut mines all over the country. The greatest battle has focused on the huge untapped reserves in the Galilee Basin in central Queensland—an area the size of Britain. Nine mega coal mines planned for the region would together nearly triple Australia’s thermal coal exports, from 195 million metric tons per annum to 512 million. Though Abbott’s government refuses to count the emissions of coal that it exports, the completed Galilee complex would create more emissions than all but six countries in the world. The largest project planned for the Galilee Basin is the Carmichael Coal Mine and Rail complex, owned by the Adani Group—a massive industrial conglomerate whose Indian patriarch, Gautam Adani, has such close ties to Prime Minister Narendra Modi that Adani’s stock rose the moment Modi was elected. Adani’s proposed mine would export an average of 60 million metric tons of coal per year, through an integrated system of mines, transportation and port facilities, including a new 241-mile rail line from the mines to the sea. The current port at Abbot Point can only handle 50 million metric tons a year; Adani wants to expand capacity to 120 million metric tons, in part by dredging a section of the Great Barrier Reef. Adani launched the project when the international price of thermal coal was around $100; that price has since fallen to approximately $60 and is showing no signs of recovery. The inferior quality of Carmichael’s coal—and Adani’s need to sign early preferential contracts—also means that the conglomerate is likely to receive even less per ton than that. As a result, its financial problems have ballooned. The Adani Group initially estimated the total cost of the project as $12.7 billion, and it has had trouble raising the capital. Adani executives signed a memorandum of understanding for a $1 billion loan with the State Bank of India, the largest loan SBI has ever extended to an Indian company for an overseas project. The loan has come under political attack in the Indian parliament, prompting SBI to consider rescinding it. Adani’s attempts to borrow money on the international market have been rejected by eleven major banks, which have openly questioned the financial viability of the project and expressed concerns about its environmental impact. Over the last decade the national and state governments of Australia have strongly supported Adani’s desperate efforts to push the project forward, including pledging hundreds of millions in infrastructure subsidies and granting permits to dredge the port and dump the dredge spoil back into the ocean. Their actions have spurred the United Nations’ World Heritage Committee to consider moving the Great Barrier Reef, a World Heritage Site, into the “in danger” category, a proposal that is being fought by the Australian government in capitals around the world. Australian voters are steadily losing confidence in Abbott and his party. On January 31, the people of Queensland, who typically vote conservatively, shocked the country by throwing out the Liberal-National coalition and boosting the Labor Party from nine to forty-four seats in the legislature. The new Labor-controlled government, however, has been reluctant to cancel the Abbot Point project, which is held up as a source of employment. That said, it has withdrawn the offer to co-fund construction of the railways connecting the Galilee Basin to the coast, and has announced that it wants dredge spoil to be dumped on the Abbot Point port site rather than on nearby wetlands or in the World Heritage waters. These actions could add millions to the project and blow out proposed timelines as well. The Galilee Basin project is not the only untenable fossil fuel project that Abbott and Australian state governments are pushing. Government officials recently revealed that they were reviewing applications for sixteen new or expanded mines in the Hunter Valley, an agricultural region in New South Wales with farms and wineries already scarred by scores of huge open mines. 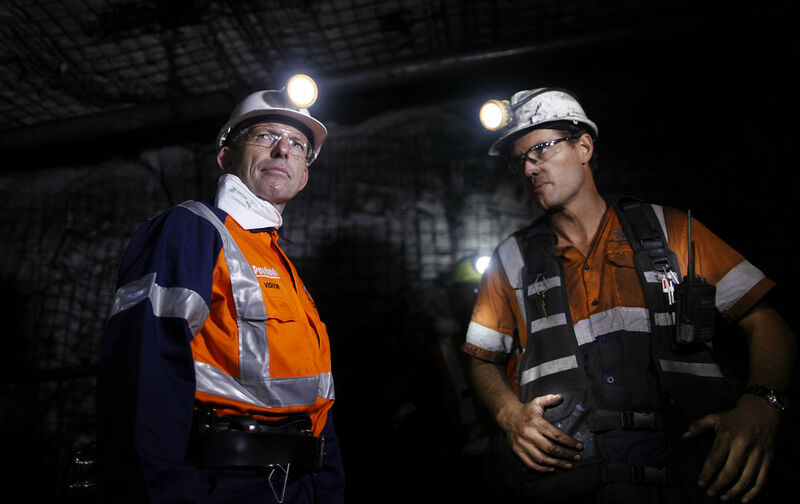 At the same time, miners and governments have left more than 50,000 mines around Australia abandoned and unremediated—some of them waiting to catch fire. The government’s love for fossil fuels extends past coal. The state government of Western Australia has developed an irrational passion for hydraulic fracturing to obtain natural gas for export. The exuberance, however, has overlooked a critical limiting factor: water. Western Australia, a state almost four times larger than Texas with nearly 13,000 miles of coastline, is one of the driest places in the country. Rainfall in the southwestern region of the state has dropped nearly 20 percent since 1970, in part due to climate change, and the supply is now so tight that the government is charging for water and imposing limits on families for domestic use. Fracking, however, requires millions of gallons per well. And the state government plans to provide the fracking companies with this scarce water for free. Some Australians, fed up with these dirty-energy policies, are vigorously fighting back. There is growing discontent that the government pours $10 billion in subsidies to fossil fuel companies mostly owned by foreign investors. There is fury among farmers and rural communities that landowners have no legal means of blocking drilling on their land. Many citizens believe that coal is a dying industry and that the government should move aggressively toward an economy supported by 100 percent renewable energy. Researchers at the University of New South Wales recently released a report detailing how this could be achieved with existing technology through an adjustment in carbon pricing. Foundations, unions, pension funds and universities have been drawn into the debate, and some of them have already divested their fossil fuel investments to show their lack of confidence in the industry. Many Australians also recognize that they are ideally placed—with inexhaustible supplies of sun, wind and ocean power—to act as global leaders in the low-carbon future. They have watched as nations like Germany and Denmark have undertaken rapid transformations of their economies with great success and higher employment. Even without special financial incentives, Australian families are continuing to add solar panels to their homes, thus steadily undermining the centralized electric utility industry. The town of Mackay, smack in the middle of coal country, gets 30 percent of its electricity from a biomass power plant owned by a sugar company. The firm decided to power some of its operations by burning bargasse, a byproduct of sugar refining, and then selling twenty-six megawatts of excess power to the local community. The company says that it could provide some 80 percent of the town’s power if the government were to support the expansion of renewable energy production. Australia has built seventy-one major wind farms, a significant achievement for a nation of 23 million people. Carnegie Wave’s Perth project, which powers the Stirling naval base on the western coast, has created an innovative new way of generating energy, mooring massive underwater buoys that transfer pressurized water to turbines onshore; it is now operational. “The resource that hits our coastline every day could power the state ten times over,” said Carnegie Wave CEO Michael Ottaviano. The company plans to install the technology at locations globally. Everyday Australians have also channeled their opposition into direct action. Campaigning organizations like 350 Australia and Lock the Gate have organized protests and blockades to protect land from mining and to close the most polluting facilities. The people of Bentley succeeded in stopping fracking on their back doorstep. Hundreds of citizens participated in Australia’s longest-running community blockade of a coal mine at Maules Creek. The community of Bulga is standing up to the New South Wales government’s threats to relocate their homes to make way for Rio Tinto’s monstrous Warkworth coal mine. Morwell, like other towns across the country, is ready for change, but the only message people hear from the government is that they must accept the tyranny of coal forever. Refusing to give up, a local group is trying to prepare a plan to transition away from coal into a clean energy future. The struggle in Australia will determine not only the future of that country, but in many ways that of the world. If the coal barons, international conglomerates and right-wing politicians have their way, the nation will become one more force driving the planet past its carbon threshold. But Tony Abbott’s plans have sparked new resistance from all branches of Australian society, so much so that his leadership within the Liberal Party was recently challenged by his parliamentary colleagues. In the state elections on March 28 in New South Wales, the Liberal-National coalition also saw its elected members in the Legislative Assembly decline by 11 percent. When a government pours everything into supporting an industry whose days are numbered, its days may be numbered too.